As some of you may know – I have been tabletop gaming for nigh on 30 years, now. Let us consider that. 30. Years. I was going to just post an image of a walker, to give y’all the “aged Bon” impression. 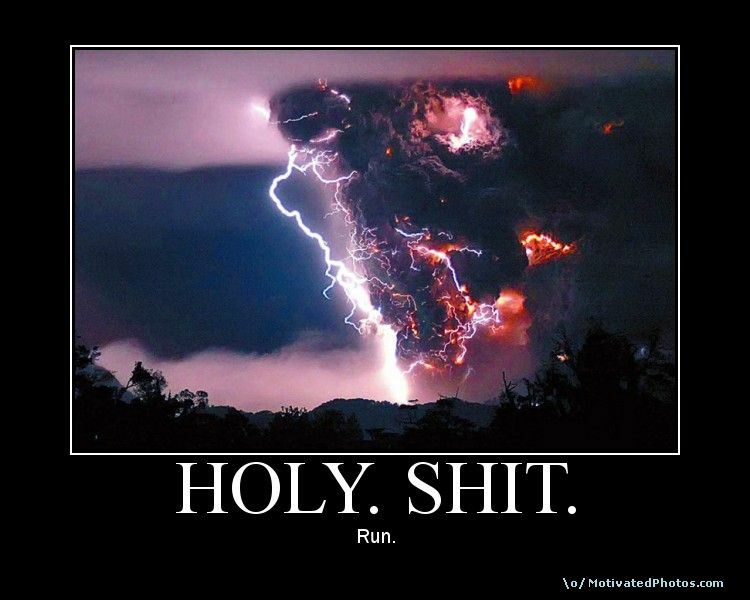 But, the image search results amused me to no end. So, I share. Because I am cool like that. I have been in many groups over the years, but my favorite is the one I am in currently. We’ve been together1 for fifteen years, give or take. The membership has flexed a bit as we have gone along. People have moved (or divorced, please see footnotes) away for jobs, marriages, and school. However, the core has remained pretty solid. The same five or six people, getting together on at least a monthly basis, for fun and mayhem. And maybe a glass of wine or two. Over the years, we have all taken turns with the GM responsibilities. All of us are freaking brilliant, btw. I mean that, without any artifice or false humility. Brilliant. Most of the players in this group are writers, of one stripe or another. All of us love the game, love building worlds and characters, stories and plots2. We live for the moment when we see the shocked look in our players’ eyes. The look that tells us that the story grabbed them, taken them to a place that they never expected. Making someone cry because of what you have done to their character – happy tears, mind – is one of the better feelings you can have. It’s like watching someone experience the story you have written, as if it were real. I can only hope that this makes sense to the non-gamers out there. ANYhoo. I tell you all this to relate an amusing anecdote. My personal favorite GM within our group is a fella by the name of P. P is literally a gamer for a living. He makes and writes and helps put out into market video games. I am totes jelly.3 On top of all this, P has a voice and personality like Brian Blessed (if you don’t know who that is, shame on you) and Jim Carey (of Grinch fame) had love child who was subsequently raised by Bill Hicks. And poor P. He had to put up with all of us. Because we don’t – and I think are physically and mentally incapable –actually follow the plot as set down in a game. Even with a tasty, tasty set of plot hooks scattered before us, we generally wander off in a completely different direction. ooh, look! 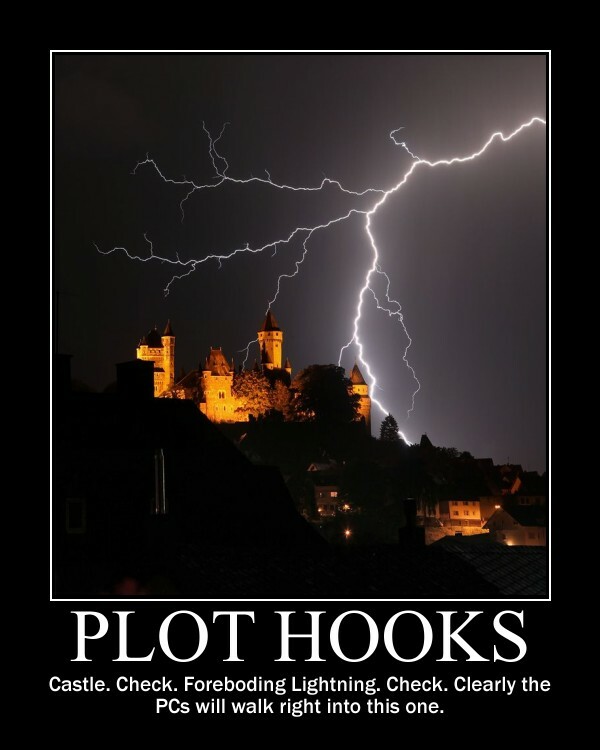 Shiny plot hooks. Let’s go the other way! Or, as has happened on a couple of different occasions, accidentally kill the NPC with the information that we need to complete the campaign. 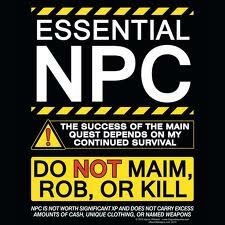 We considered making these as T-Shirts to wear whilst GMing. Oh, nothing. Just the shiny button. The shiny, candy-like, red button. I’m just sayin’ P. That it wasn’t our fault. The button was too pretty. 1 – Before you say anything about my choice of words, consider this: 15 years. I know of marriages (mine included) that have lasted for far less time. 2 – Yes, of COURSE those two are different things. 3 – I am allowed to say things like that because I have a 14-year-old daughter. My claim is that her vocabulary is influencing mine.